I’m delighted to share that NASA has been named the “Best Place to Work” among large agencies in the federal government for an impressive fifth year in a row. The credit for this accolade goes entirely to the NASA workforce, and I am honored to work with every one of them and serve as NASA Administrator. The annual results of this survey of federal workers is published by the Partnership for Public Service. It ranks nearly 400 federal organizations by overall employee satisfaction and commitment, and also evaluates key workplace focus areas, such as innovation, training and development, leadership and diversity. This year, participation in the survey increased across the board across all of our NASA centers, which means that more of our workforce made their voice heard about what they love about working at NASA – as well as what they’d like to see improved. The NASA workforce’s passion and dedication to our missions and each other is also evident in this year’s results, because every single question increased in percent favorability. This commitment to continuous innovation – whether applied to our missions or to improving our work environment – is what makes NASA so special, and is the fuel for our journey to Mars and all of our cutting edge missions in air and space. I want to thank the Partnership for their continued recognition of the importance of public service and their efforts to call positive attention to federal workers and to careers in the federal government. I also want to give a special thanks to our mid-level managers and supervisors — the frontline resource and role models to our thousands of employees. They motivate all of us to go above and beyond as we reach for new heights in exploring space, learning more about our planet and enhancing human capabilities. As I reflect on my time as NASA Administrator, I feel incredibly proud to call everyone in the NASA workforce my colleagues. I’ve always said that they are creating the future, and no matter their area of expertise, their commitment to the agency’s missions in every area has made all of our accomplishments possible, and makes everything we dream for achievable. There are some moments that will stay with you your entire life. I’d be willing to bet that most of the people with whom I spent this morning at NASA’s Goddard Space Flight Center would put the experience in that category. You see, we were able to see with our own eyes the amazing progress that’s being made on the James Webb Space Telescope, which will soon be humanity’s eye into the secrets and mysteries of the universe. 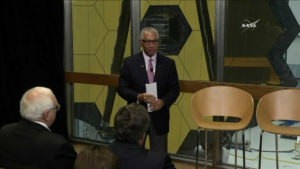 Administrator Bolden showcases the James Webb Space Telescope at NASA’s Goddard Space Flight Center in Greenbelt, Md. Just recently, we completed the first important optical measurement of JWST’s segmented mirror, called a Center of Curvature test, to measure the shape of Webb’s mirror before it goes into the testing chambers. We also just finished the sunshield layers, which will protect Webb’s sensitive instruments from the sun once it’s in space. As we reach for new heights for the benefit of all humankind, NASA has always sought to unravel the mysteries of our universe; to find out where we come from, where we are going, and whether we are alone in the universe. 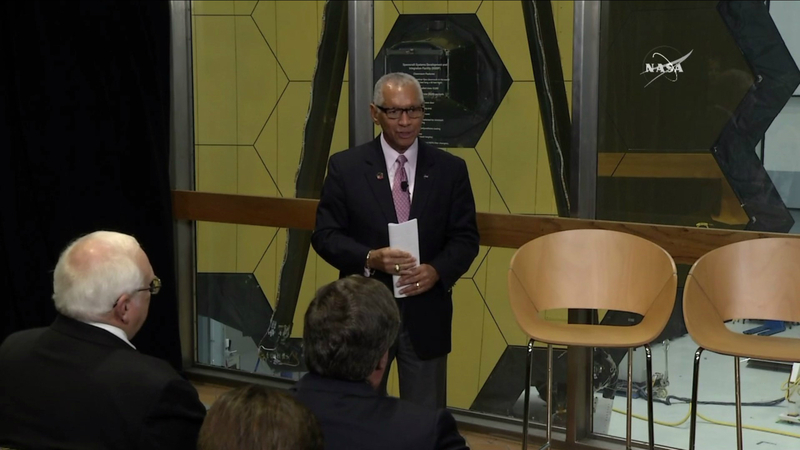 We are building the James Webb Space Telescope to answer these age-old questions and to bring us to new heights in discovery, understanding and human progress. Webb will allow us to explore ever further into the cosmos, seeing things far beyond the capabilities of the Hubble Space Telescope. It will see the universe light up with the first galaxies to form after the Big Bang and study the formation of star systems capable of supporting life on planets like Earth. Webb will help us search for signs of life and learn more about the habitability of planets discovered by our fleet of planet hunters and world explorers, including Kepler and the upcoming Transiting Exoplanet Survey Satellite. Webb will also help us understand the evolution and composition of our own Solar System, from the icy moons around Jupiter and Saturn, to known comets and asteroids. It will help us on our Journey to Mars by helping us understand more about the Red Planet, including Martian climate patterns. Upon completion, Webb will be the largest and most complex space observatory that anyone on planet Earth has ever built. At about the size of a tennis court, it will be folded origami-style to fit in the Ariane 5 rocket (about 5 meters wide), and will unfurl in cryogenic temperatures where materials behave in ways that defy everything we’re used to on Earth. It will be launched from French Guiana in 2018. Even before Webb allows us to rewrite textbooks and answer questions we have not yet thought to ask, it is already shattering the boundaries of space technology. What’s more, it is changing the field of materials science. Webb is the work of our nation, with more than 120 American universities, organizations, and companies in 27 states coast to coast (including Hawaii) bringing together some of the brightest minds in our country to make Webb a reality. Webb’s findings will be incorporated into science, technology, engineering and mathematics (STEM) education worldwide, inspiring future generations of explorers, scientists and engineers. It will capture the imagination and dreams of millions who dare to look to the sky and wonder. At the same time, it is an international collaboration — a partnership among NASA, ESA (the European Space Agency) and the Canadian Space Agency (CSA). NASA’s Goddard Space Flight Center in Greenbelt, Maryland, is managing the development effort. Northrop Grumman is the main industry partner and the Space Telescope Science Institute will operate Webb after launch. Dr. Martin Luther King, Jr. once said “In a real sense all life is inter-related. All [people] are caught in an inescapable network of mutuality, tied in a single garment of destiny.” One might also say that we are in a web of mutuality … a “Webb” (pun intended) that has the potential to unite the world in understanding, discovery and awe. As I reflect on my multiple international engagements over the past month, including discussions on the human Journey to Mars with representatives from 17 space agencies at the International Astronautical Congress in Guadalajara Mexico, and participating this week in the second U.S.-China Civil Space Dialogue, I can’t help but feel deep pride in NASA’s accomplishments as a global leader in space and aeronautics research. Currently, NASA has over 750 active agreements with more than 120 nations around the world for cooperation that contributes to almost all aspects of NASA’s activities. The relationships NASA has developed over more than 50 years of international cooperation and successful implementation of thousands of international agreements have set the stage for robust international participation in NASA’s plans for the human Journey to Mars. One key aspect of our exploration program is a sustainable, affordable expansion of human presence into the solar system – not a piecemeal mission or two, but a foundation for ongoing pioneering efforts that will evolve as we learn from earlier missions. NASA is proud of the substantial progress we have made in developing the next generation of human spaceflight assets – the Orion crew capsule, the Space Launch System (SLS) rocket and Exploration Ground Systems (EGS) to support their launch. Working closely with partners from 14 nations we’ve also been using the International Space Station (ISS) to prepare our astronauts to explore beyond low-Earth orbit (LEO) and into the proving ground of cislunar space. I was pleased this week to participate in the second U.S.-China Civil Space Dialogue along with the State Department’s Deputy Assistant Secretary Jonathan Margolis, Mr. Tian Yulong, Secretary-General of the China National Space Administration (CNSA), and distinguished members of the Chinese and American delegations. I expressed my congratulations on behalf of the entire NASA family to Mr. Tian on last month’s launch of the Tiangong-2 laboratory and the recent launch of the Shenzhou-11 crewed mission — major milestones in China’s human space flight program. I visited China this past August and one of the main goals of that visit was to conclude the Air Traffic Management agreement between NASA and the Chinese Aeronautical Establishment (CAE). While not a topic included under the Civil Space Dialogue, this agreement is an important milestone for NASA’s cooperation with its Chinese counterparts. While I was in China, I was also pleased to discuss the progress in several areas of our cooperation in Earth and space science and to hear about recent developments and plans for China’s human space flight program. Our human Journey to Mars requires collaboration with many nations, each with their own interests and expertise. Right now, the European Space Agency is providing the service module for the Orion spacecraft that will carry astronauts to deep space in the coming years. We also have hundreds of agreements with other nations in science, such as the many partners providing support and instrumentation for every one of NASA’s missions to Mars, including the Mars 2020 rover, one of many precursors planned to support humans visiting the Red Planet. NASA’s international partnerships are strong and our exploration strategy is consistent with the Global Exploration Roadmap (GER), released by the international space agencies participating in the International Space Exploration Coordination Group (ISECG). The GER reflects a common vision for deep-space exploration shared by NASA and our international partners and defines common goals for missions to cislunar space, near-Earth asteroids, the moon and Mars. NASA is well positioned to continue to lead the world to new heights in space and innovations in technology. We have a sustainable plan to extend humanity’s presence into the solar system, advance our capabilities in aeronautics and understand our universe and the planet on which we live that is technically sound and fiscally reasonable. Advancing humanity’s reach is truly a global endeavor and I am confident NASA will maintain its constancy of purpose as we lead by example and engage nations around the world in continuing to make the impossible, possible. NASA is proud to have been named the “Best Place to Work” in the Federal Government (among large agencies) for the past four consecutive years by the Partnership for Public Service. Using the Federal Employee Viewpoint Survey (FEVS) as a focal point for guidance, over time we have developed a positive work culture with a high level of employee engagement through deliberate, proactive initiatives. I’ve always told our employees that their voices matter. At NASA, it’s especially critical, as much of our work is difficult and dangerous, and sometimes lives are in the balance. We must have a culture where speaking up and providing feedback is encouraged. I’ve made nurturing that culture a centerpiece of my leadership, and we created a Workforce Culture Strategy to communicate and codify these values. With some 18,000 employees at NASA, getting feedback can be daunting, and the FEVS helps provide a vehicle where people feel they can be candid and offer constructive comments without putting themselves or their jobs at risk. We use it to help offices within our organization to improve and to share their successes. At NASA, we consider ourselves a family and, like any family, there can be some bumps in the road. The FEVS helps us get past them. Based on last year’s employee feedback, we focused this year on second-level performance reviews to support and encourage fairness in ratings, and we created a Leader’s Handbook to guide supervisors and employees, and to foster organizational health. I’m still listening – and feel privileged to be working with such a talented, creative workforce. The best part of serving as NASA Administrator continues to be witnessing how open and honest opinions and ideas have changed NASA for the better. Our entire NASA senior leadership team sincerely cares about our workforce’s opinions and is ready to take action. I want to thank my colleagues and their teams for using the FEVS to make progress on employee engagement. I know agencies across government are using this important tool to make similar strides. All of us need to work each and every day to make sure the talented people who work for the Federal Government feel valued, included, and engaged in their jobs. This week, I embarked on a visit to Japan for discussions with a variety of senior Japanese government officials about our mutual interest in space exploration. I will also visit NASA’s outstanding partners at JAXA, the Japan Aerospace Exploration Agency. With more than 30 active agreements in place, NASA and JAXA have one of the strongest, most comprehensive and longest lasting space bilateral relationships of any two nations in the world. One of the greatest illustrations of this partnership is the International Space Station (ISS), orbiting 250 miles (400 kilometers) above the Earth at 17,500 miles per hour (about 28,000 kph) with six astronauts on board as I write this! NASA’s Journey to Mars is taking shape aboard the orbiting laboratory, where astronauts from different countries are working together to advance research and technology that will allow future astronauts to travel deeper into space, at the very same time we create jobs and improve our quality of life here on Earth. Japan and the United States are working together aboard the Space Station with many other international partners – and we will be for the foreseeable future. Today, Japanese astronaut Takuya Onishi and American astronauts Jeff Williams and Kate Rubins are living and working together with their Russian crewmates at the cutting edge of innovation, science and discovery. Their research ‘Off the Earth, For the Earth’ promises to deepen understanding and expand human progress around such areas as medicine, biology, technology, Earth science, material production and communications – and that’s just the short list! Because leaders in both the U.S. and Japan have chosen to extend our Space Station participation through at least 2024, the promise and potential progress that comes out of this research will continue for years to come. In the more immediate future, the research benefitting all of humanity will be bolstered by cargo delivered to station aboard Japan’s upcoming HTV-6 mission (which, as was announced recently, is set to launch in October of this year). As we consider the bright future of our partnership, I’m very much looking forward to joining our friends at JAXA this week for a ceremony to officially open a control room for Kibo, the Japanese Experiment Module on ISS. Kibo is, appropriately, a Japanese word meaning “hope,” and I believe that “hope” is an excellent description of the research that’s being conducted aboard the International Space Station and the cooperation that goes into it. The International Space Station is the embodiment of this sort of hope and effort. Consider this: more than 220 human beings from 18 countries have visited the International Space Station; tens of thousands of people have been involved in its construction and operation; and people from dozens of countries have had their research and experiments flown aboard it. As we look forward to an exciting future exploring space, I am also enthusiastic about advances the U.S. is making in airspace travel a little closer to Earth. We are in the midst of an incredible moment in the history of aeronautics. With President Obama proposing an historic investment in green aviation, we have an opportunity to make air travel cleaner, greener, safer and quieter – even as our skies grow more crowded and aircraft fly faster. One of the more important areas of NASA aeronautics research is air traffic management. Our country’s skies will have to absorb an estimated four billion more passengers over the next several decades and it’s essential that we do this without compromising the safety of our skies. We in the United States are not the only country with an interest in building a more efficient air traffic management system. International commerce depends on air transportation and it is imperative that we work together with partner countries around the world to maximize human resources and investment for the benefit of all humanity. With this in mind, after my visit to Japan I plan to travel to China to discuss areas of mutual interest in aviation research between NASA and the Chinese Aeronautical Establishment (CAE). This will be part of ongoing conversations that began in November of 2014 and have continued through a NASA-CAE workshop in Beijing that was held in August 2015. Taken together, our partnerships around the world continue to instill optimism – and inspire hope – about the future of space exploration, aeronautics and our ability to write our own destiny – together. Climate change is one of the most pressing issues of our generation and it affects every person on Earth. Tracking the changes in the global climate is the basis for understanding its magnitude and extent. Today’s announcement that NASA and NOAA scientists have determined that 2015 was the hottest year in recorded history underscores how critical Earth observation is. The NOAA-NASA collaboration has served the country very well, from the origin of space-based remote sensing for weather forecasting to the Earth system monitoring and science that are so crucial to tackling the issues of our times. This announcement is a key data point that should make policy makers stand up and take notice — now is the time to act on climate. The modern temperature record dates back to1880, and 2015 was the warmest year by a long shot. There has been a lot of talk about the strengthening El Niño in the Pacific Ocean and how that might be supercharging temperatures. El Niño did likely play an important role – but more significantly, 2015’s record temperatures are the result of the gradual, yet accelerating, build-up of carbon dioxide and other greenhouse gases in Earth’s atmosphere. Scientists have been warning about it for decades and now we are experiencing it. This is the second year in a row of record temperatures and what is so interesting is that the warmest temperatures often occur the year after an El Nino, like in 1998 compared to 1997. Fifteen of the 16 warmest years on record have now occurred since 2001. Temperatures will bounce around from year to year, but the direction of the long-term trend is as clear as a rocket headed for space: it is going up. Sea levels are rising – nearly three inches in the past two decades alone. The successful launch earlier this week of the NOAA-led Jason-3 mission will continue our 23-year record of measuring sea level change from space with remarkable precision. In the coming years and decades, our work to understand how quickly seas are rising will be vital to coastal cities in the U.S., millions of people around the world who live in low-lying areas, and to NASA’s own facilities at Kennedy Space Center, where we will one day launch astronauts to Mars, and other affected facilities such as the Stennis Space Center, Wallops Flight Facility and Michoud Assembly Facility. The Arctic ice cap is shrinking. In the 1970s and 80s, NASA scientists pioneered techniques to measure the extent of sea ice at the poles. That new ability quickly gave way to the realization that the Arctic ice cover – which plays a significant role in the planet’s climate and even the weather we experience in the U.S. – is retreating and growing thinner. NOAA’s global drifting buoy program and other NOAA and international ocean temperature and land surface temperature measurements have provided the means to measure the temperature at the Earth’s surface, so critical to our survival. Ice sheets and glaciers worldwide are shedding ice. Greenland is losing about 300 billion tons of ice per year, according to measurements from NASA’s GRACE mission. Observations from the agency’s Operation IceBridge have helped confirm rapidly accelerating changes in the West Antarctic Ice Sheet and the dramatic retreat of glaciers in Alaska. Given the pace of these changes and their significance for the climate and sea level rise, we need close and continuous monitoring. In 2017, NASA will launch two missions – GRACE-FO and ICESat-2 – that represent a major refresh of our capabilities to observe how ice sheets and glaciers are changing. Rising temperature is not an isolated effect of rising greenhouse gas levels, and scientists are still studying the full implications of a warmer world. How might patterns of drought and precipitation change? Will ecosystems and species be able to adapt to human-induced climate change? What might these changes mean for wildfires, agriculture and the economy? Climate change isn’t a problem for the future. Earth’s climate is changing now. At NASA, we use our unique vantage point from space to study the planet as a whole system. NOAA’s scientists are on the ocean, land and in the sky collecting data that help bring clarity. Our job is to answer these kinds of questions, to make the measurements needed to get to those answers and to provide our knowledge and our data freely so the world can address this fundamental challenge. NASA is on a Journey to Mars and a new consensus is emerging around our plan, vision and timetable for sending American astronauts to the Red Planet in the 2030s. Our strategy calls for working with commercial partners to get our astronauts and cargo to the International Space Station while NASA also focuses – simultaneously — on getting our astronauts to deep space. Few would have imagined back in 2010 when President Barack Obama pledged that NASA would work “with a growing array of private companies competing to make getting to space easier and more affordable,” that less than six years later we’d be able to say commercial carriers have transported 35,000 of pounds of space cargo (and counting!) to the International Space Station (ISS) – or that we’d be so firmly on track to return launches of American astronauts to the ISS from American soil on American commercial carriers. But that is exactly what is happening. Since the first SpaceX Dragon commercial resupply mission to deliver cargo to the ISS in October 2012 and Orbital ATK’s first Cygnus mission in January 2014, American companies have delivered cargo to the Space Station that enables our astronauts to work off Earth for Earth on extensive and ongoing scientific research and technology demonstrations aboard the Space Station. This has included investigations that directly benefit life on Earth and expand commercial access to microgravity research through the U.S. National Laboratory (which is operated by the Center for the Advancement of Science in Space or CASIS). All this matters because NASA research helps us understand our home planet as well as the solar system and beyond, while technology demonstrations and human health research like astronaut Scott Kelly’s one-year mission and the Twins Study aboard the Space Station prepare us for long-duration missions into deep space. As a result, we are closer than ever before to sending American astronauts to Mars and at the very same time, we’re “insourcing” American jobs and empowering American entrepreneurs and innovators to expand the nascent commercial market in low-Earth orbit. Today, thanks to the bold plan laid out by the President, Americans are working at more than 1,000 companies in nearly every state in the Union on NASA commercial space initiatives. Across the board, about 80% of NASA’s activities are carried out by our partners in industry and at America’s academic institutions. We develop more than 1,600 new technologies a year and work with business partners to transfer thousands of products, services and processes into the market for job creation and economic growth. More venture capital was invested in America’s space industry in 2015 than in all the previous 15 years combined. In other words, at NASA we’re exploring deep space, but we’re anchored right here on Earth, where we’re creating jobs and fueling innovation, technology development and growth, recognizing that it all depends on American ingenuity and innovation. With the recent passage of the FY2016 federal budget and our selection of Robert Behnken, Sunita Williams, Eric Boe and Douglas Hurley to be the first NASA astronauts to train to fly to space on commercial crew vehicles, we are close to returning human launches to American soil and ending our sole reliance on the Russians to get into space. In addition, the commercial crew spacecraft will enable us to add a seventh crew member to the normal Space Station crew complement, effectively doubling the amount of crew time available to conduct research off Earth for Earth. The additional research (and crew supplies) will be delivered during cargo resupply missions. Despite critics who may have said this was a pipe dream just five short years ago, we continue to transform the way NASA does business and as a result, today we’re able to mark another significant milestone that will carry President Obama’s vision further into the future. This afternoon, our ISS team in Houston will announce that NASA is making its new award for commercial space cargo delivery to the ISS. This is a big deal, because our commercial resupply missions enable NASA and our private industry and other government agency partners to continue the extensive, ongoing scientific research aboard the Space Station. President Obama extended the life of the International Space Station through at least 2024 (with the support of Congress) and our commercial cargo providers ensure cargo resupply missions continue, enabling us to keep using the station as our springboard to the rest of the solar system and a test bed for human health in space. Today’s selection builds on our initial resupply partnerships. It will ensure that NASA maintains the capability and flexibility to operate the ISS and conduct the vital research of a unique National Lab through resupply services launching from the United States. As President Obama said, “in fulfilling this task, we will not only extend humanity’s reach in space — we will strengthen America’s leadership here on Earth.” Our investment in commercial space is creating jobs and it’s bringing us closer to sending American astronauts to Mars. Competition, innovation and technology – it’s the American way. It’s helping us to Launch America. NASA is uniquely positioned to study our home planet, and Earth observation has been at the core of the agency’s work since our founding. In addition to a fleet of amazing satellites that we and our international partners use to study our planet in a range of wavelengths, and across the spectrum of planetary features from oceans to atmosphere and ground cover, the International Space Station is also rapidly becoming a significant platform to study Earth. Our work has global implications. This week, a small delegation of NASA leaders have been participating with a larger U.S. delegation at the 21st session of the U.N. Framework Convention on Climate Change (UNFCCC) Conference of Parties, also known as COP-21. COP-21 will bring nearly 200 nations together to reach an agreement on limiting climate change. Global climate change, driven by rising levels of carbon dioxide and other greenhouse gases in the atmosphere, represents a fundamental challenge to the U.S. and the world. It is the challenge of our generation. While NASA has no formal role in the COP-21 climate policy talks, the agency is hard at work providing the nation and the world the best information possible about how Earth is changing. Regardless of what world leaders decide in Paris, our job is to build an understanding of the whole planet now and what it will look like in the future. NASA’s comprehensive study of Earth has provided much of the underlying understanding of current trends in the planet’s climate – including definitive measurements of rising sea levels, glacier retreat, ice sheet changes and the decline in the volume of the Arctic sea ice cap. Our satellites have provided global, long-term views of plant life on land and in the ocean. And our supercomputing power is allowing us to better understand how all the parts of the Earth system work together and help us to predict how this could change. We will continue to monitor climate trends and investigate other ways in which the planet is ultimately responding to increasing greenhouse gas levels. We have discovered more than a thousand planets outside of our solar system, but none yet match Earth’s complexity. That’s one reason we have more satellites orbiting Earth than any other planet. We made a significant expansion of the Earth-observing fleet in 2014 and 2015, launching missions that are making unprecedented measurements of rainfall and snow (Global Precipitation Measurement), carbon dioxide in the atmosphere (Orbiting Carbon Observatory-2), and soil moisture (Soil Moisture Active Passive). Soon, with the help of NOAA, the French Space Agency CNES, the European Organisation for the Exploitation of Meteorological Satellites -EUMETSAT and SpaceX, we will launch the Jason-3 mission to continue building on the vital, two-decade record of how much and where global sea level is changing. The view from space is incredible – seeing our planet from orbit is one of the highlights of my life — but sometimes we need to get in a little closer. So in the 2015 and throughout 2016, NASA is sending scientists on expeditions to all corners of the planet – by plane, by ship and even by foot – to get an on-the-ground look to help answer some important science questions. How are warming ocean waters melting Greenland glaciers and adding to sea level rise? How are the world’s coral reefs responding to changes in the ocean? What will rapidly warming temperatures in the Arctic mean for the greenhouse gases stored in forests and permafrost? Our scientists are putting together multi-year campaigns that will complement our space-based perspective. Consider it planetary exploration right here at home. Global meetings like COP-21 are important for discussion and policymaking, and NASA will continue the day to day work of monitoring our Earth observation satellites and making their wealth of data available to people across the globe. There’s no more important planet for us to understand.